Background: Type 1 diabetes mellitus increases the risk of coronary heart disease. The Pittsburgh IDDM morbidity and mortality study reported greater than 10 fold coronary heart disease mortality compared with US national data  . Adults with diabetes have heart disease death rates 2 to 4 times higher than adults without diabetes  . Diabetic cardiomyopathy explains much of this survival difference and carnitine deficiency is a cause of cardiomyopathy. Research Design and Methods: Adult subjects (40) with type 1 diabetes mellitus were seen for a routine annual visit having no clinical complaints. Fasting serum samples were collected for annual chemistries and the measurement of carnitine. Results: The mean total (40.8 ± 8.8) [40 - 80 nmol/ml] and free (32.9 ± 7.9) [30 - 60 nmol/ml] carnitine levels for this group included 43% low total and 28% low free carnitine. The mean esterified/free (E/F) carnitine ratio (0.25 ± 0.09) for this group was elevated indicating carnitine insufficiency. Conclusions: Fatty acids are the primary energy source for diabetic heart muscle, and carnitine is essential for intracellular fatty acid transport and ATP production. Therefore, mild carnitine deficiency can compromise fatty acid energy production in a failing heart. Carnitine deficiency in subjects at high risk for cardiovascular failure is a possible unrecognized reason for the 4 fold increased death rate in patients with type 1 diabetes. Supplementation with oral carnitine could reduce that increased risk of heart failure, in patients with type 1 diabetes. Intravenous carnitine may be life saving when managing acute cardiac failure in patients with diabetes mellitus. Normal carnitine levels in patients with type 1 diabetes may provide a biochemical environment that prevents the long recognized idiopathic heart failure that occurs in insulin requiring diabetics as first reported in the 1974 Framingham Study. According to 2011 Centers for Disease Control (CDC) data 25.8 million children and adults in the United States (8.3% of the population) have diabetes mellitus  . In 2004, heart disease was noted on 68% of diabetes-related death certificates among people aged 65 years or older  . Type 1 diabetes mellitus increases the risk of all cause cardiovascular disease and adults with diabetes have heart disease death rates 2 to 4 times higher than the same age adults without diabetes  . A large body of epidemiological and pathological data documents that diabetes is an independent risk factor for cardiovascular disease in both men and women  . When patients with diabetes develop clinical cardiovascular disease, they sustain a worse prognosis for survival than do cardiovascular disease patients without diabetes   . One reason for the poor prognosis in patients with both diabetes and ischemic heart disease seems to be an enhanced myocardial dysfunction leading to accelerated heart failure, called diabetic cardiomyopathy  . Diabetic cardiomyopathy is said to exist only if there is no coronary arterial disease to explain the heart muscle weakness. Four causes cited for the development of diabetic cardiomyopathy are: 1) microangiopathy; 2) related endothelial dysfunction; 3) autonomic neuropathy; and 4) myocardial metabolic alterations which compromise energy production  . Under normal conditions, fatty acids are the preferred substrate for the adult myocardium, supplying up to 70% of total ATP production  . Pyruvate derived from glucose, glycogen, lactate and exogenous pyruvate is also oxidized by pyruvate dehydrogenase localized within the inner mitochondrial membrane as a secondary substrate for normal myocardial energy production, if sufficient intramitochondrial CoA is available. Cardiac muscle derives most of its energy from mitochondrial fatty acid oxidation. Fatty acid oxidation is a process that includes mitochondrial uptake of fatty acids as fatty acylcarnitines, their transport into the inner mitochondrial membrane by a translocase for β-oxidation through the tricarboxylic acid cycle, and oxidative phosphorylation to produce adenosine triphosphate (ATP). The free acyl groups are then transported out of the mitochondria by reversal of the carnitine transport pathway which maintains the availability of intramitochondrial free CoA, essential for continued energy production. To use pyruvate as the substrate for energy requires the same free CoA in the mitochondria for the production of ATP as required by the fatty acid substrate. The substrate choice in the adult heart is regulated by availability, energy demand, and oxygen supply. Thus, it is not surprising that greater availability of glucose in diabetes might influence substrate utilization. However, instead of greater glucose utilization, it appears that cardiac cells exposed to the chronic high glucose concentrations of diabetes, internalize their insulin-dependent glucose transporter, GLUT4   . This results in reduced intracellular glucose transport for subsequent ATP production. The myocardium of diabetic hearts not only show a reduction in glucose utilization but also a pronounced decrease in lactate utilization for ATP production  . Because of reduced glucose uptake, cardiomyocytes of diabetic subjects must increase fatty acid β-oxidation to almost 100% for sufficient ATP production  . Carnitine availability, therefore, becomes critical for energy production in the diabetic myocardium. Carnitine, by controlling the influx of fatty acids into the mitochondria, regulates the substrate supply for β-oxidation which produces the ATP required for normal cardiac function  . Efficient mitochondrial energy production also requires the free L-carnitine inside the mitochondria to esterify fatty acid acyl-groups for transport out of the mitochondria to leave sufficient free CoA in the mitochondria for continued ATP generation from any available substrate  . If the amount of free CoA in the mitochondria falls because of the accumulation of fatty acid acyl CoA derivatives, there would be a rapid shutdown of mitochondrial energy output  . Elevated fatty acylcarnitine (esterified carnitine) in the serum may also reflect elevated fatty acid acyl CoA inside the mitochondria, which would then result in reduced free CoA and thereby reduced ATP production in the cardiomyocytes. An animal study has demonstrated that a reduction in resting cardiac heart rate and an increase in left ventricular size occurs in association with low serum free carnitine and elevated serum esterified/free (E/F) carnitine levels in streptozotocin induced diabetic rats. Oral carnitine supplementation did normalize serum carnitine, heart rate regulation and left ventricular size in those animals  . Another report demonstrated that diabetes-induced bradycardia is an intrinsic metabolic defect (independent of sympathetic and parasympathetic regulation), that is reversed by carnitine supplementation  . Similar reductions of serum free carnitine levels in non-diabetic rat littermates had no effect upon resting cardiac heart rate suggesting that normal myocardial glucose metabolism in the face of low serum free carnitine levels in non-diabetic animals will provide the heart sufficient functional energy. This study demonstrated an apparent reduction of myocardial function in diabetic animals with excess circulating glucose and fatty acids (the energy substrates required for normal cardiac function) when the serum free carnitine level was low and the E/F ratio elevated. To determine whether carnitine deficiency is a likely clinical issue for adults with type 1 diabetes, it was measured as part of standard care in a group of adult diabetics followed at the University of South Florida in Tampa. A group of 40 consecutive individuals with type 1 diabetes mellitus participating in an observational clinical trial approved by the University of South Florida Human Subjects Committee was evaluated for this report. Individuals participating in this study signed a form indicating that the information collected could be published as long as each individual could not be personally identified. These individuals ranged in age from 40 to 60 years (mean 51.3 ± 5.6 years) and had type 1 diabetes 22 to 39 years (mean 28.3 ± 5.4 years). 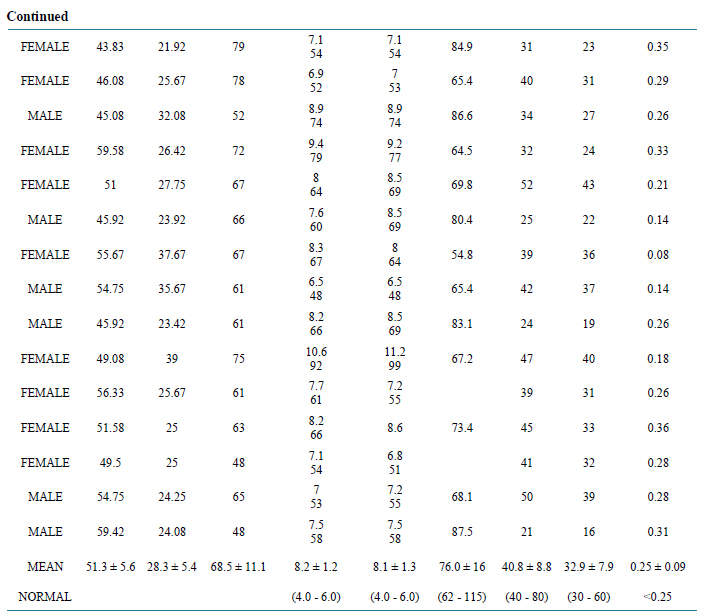 The gender distribution was 21 female and 19 male subjects (table 1). At the study visit a fasting sample of blood was collected for routine studies and an aliquot was stored at -70 degrees C to measure serum carnitine. A one ml serum aliquot was frozen and carnitine measured  in the clinical laboratory of the All Children’s Hospital in St Petersburg, Florida. These results were compared to values established for healthy adults in the clinical laboratory of All Children’s Hospital, which is CAP certified and participates in their Proficiency Testing program. These results are similar to those reported in the literature  . None of these subjects had any clinical evidence of cardiovascular, renal or liver disease. The results of these measures are being presented as an observation and have not been utilized to alter clinical management of the subjects. The average annual HbA1c for the 5 years prior to the study visit for this group of individuals was 8.2% ± 1.2% (66 ± 10 mmol/mol). The average HbA1c for these same individuals the day of the study visit was 8.1% ± 1.3% (62 ± 9 mmol/mol)indicating a stable degree of glycemic control in this group of patients. The carnitine levels for each subject are seen in the table. The normal serum total carnitine range (40 to 80 nmol/ml) and the normal serum free carnitine range (30 to 60 nmol/ml) were used for comparison. Similar normal values were reported in an article describing patients suffering from mitochondrial myopathy based on the clinical findings of muscle weakness and specific histopathologic features found on muscle biopsy  . That article indicated that carnitine levels below their normal range were associated with cardiomyopathy, muscle weakness and related muscle pathology that improved with carnitine supplementation  . Low free carnitine was found in (11/40) 28% of our study subjects. Low total carnitine was found in (17/40) 43 % of these subjects. Although none of these subjects had any suggestion of left ventricular hypertrophy or heart failure at the time of the study, the resting ECG evaluation did reveal that 8 members of the group had sinus bradycardia. Reduced intrinsic heart rate was noted in diabetic animals that were carnitine deficient  . The 8 individuals with bradycardia had a low average free carnitine of 29 nmol/ml (range 16 to 32 nmol/ml) and a low total carnitine level of 37.1 nmol/ml (range 21 to 50 nmol/ml) suggesting the same association between low carnitine and bradycardia previously noted in a diabetic animal model  . The E/F ratio for the entire group was 0.25 ± 0.09 which is greater than normal and has been defined as “carnitine insufficiency”  . The mean E/F ratio of individuals (22/40) with values of .26 or higher was 0.31 ± 0.06. Table 1 . Carnitine levels in patients with type 1 diabetes. E/F ratio for this group of patients was 0.25 ± 0.09 supporting the general observation of carnitine insufficiency in this entire group of patients. In general there is little concern about carnitine deficiency in the medical management of adults with diabetes since this is a substance made endogenously by the liver and kidneys, is nutritionally available in animal proteins (a common part of the Western Diet) and is conserved by normal kidneys which reabsorb 95% of the filtered free carnitine and only excretes the esterified carnitine  . This observation of marginal and low carnitine levels in an asymptomatic typical group of adult patients with type 1 diabetes (based on HbA1c comparisons)  , may have a variety of explanations. The effort to reduce dietary animal protein in the diabetic diet may have some benefit for lowering cholesterol and lipid levels but may also reduce the most common source of natural dietary carnitine, which is whole milk and red meat. The natural history of diabetes which tends to damage kidney and liver function may also compromise the two main sites of human endogenous carnitine production, the kidneys and liver. The excessive quantities of organic acids produced by the abnormal metabolism of diabetes are excreted in the urine as acyl-carnitine compounds  . This generalized increase in urine organic acids has been reported  to be associated with a fourfold increase in urinary esterified carnitine. Esterified carnitine (acyl-carnitine) is not reabsorbed by the kidney; therefore, the proportion of esterified carnitine found in the serum is an indicator of the portion of carnitine that will be lost in the urine. The four-fold increased loss of total body carnitine in the urine of individuals with diabetes, may result in a significant reduction in total body carnitiner eserves, with a high E/F ratio indicating less available free carnitine. The elevated serum E/F ratio may also reflect elevated cellular and mitochondrial levels which could reduce the availability of mitochondrial free CoA and thereby compromise glucose utilization by the mitochondria in addition to the reduced glucose transport previously noted in diabetes  . The type 1 patients in this group had a mean E/F ratio of 0.25 ± 0.09, which is said to represent “plasma carnitine insufficiency”  . Of these patients (22/40) 55% had an E/F ratio > 0.25 with a mean E/F ratio for that group of 0.31 ± 0.06. Thus, reduced free carnitine and increased E/F carnitine ratio could compromise both fatty acids and glucose as energy producing substrates for the diabetic myocardium. This report presents a group of patients with type 1 diabetes, who historically are at great risk for cardiovascular disease and a 4 fold greater risk for heart failure. This group of patients is shown to have unrecognized low circulating carnitine levels which may compromises the availability of both fatty acids and glucose for myocardial energy production. This observation suggests a logical, previously not considered mechanism for an important cardiac problem (idiopathic heart failure)first associated with insulin deficient diabetes in the 1974 Framingham Study  . This is a potential problem that can be prevented by oral carnitine supplementation for routine daily management and intravenous supplementation during acute cardiac crises, if physicians are aware of this problem in subjects with diabetes with/without heart failure. Based on this limited cohort of Type 1 diabetics measurement and management of serum carnitine levels in subjects with type 1 diabetes may have immediate metabolic utility to supply energy for the failing heart of individuals with diabetes mellitus. We support further study to confirm this interesting observation and exploration of the utility of oral carnitine replacement in Type 1 diabetic subjects in heart failure.